The Courtyard is situated in the heart of Manchester, ideally positioned to serve our vibrant student population, local sports fans and Manchester day trippers alike. The Courtyard offers a welcoming environment with great deals on both drinks & food. It is kitted out with multiple widescreen TV’s, heated outdoor smoking area, a huge beer garden, three pool tables and Manchester’s friendliest bar staff. 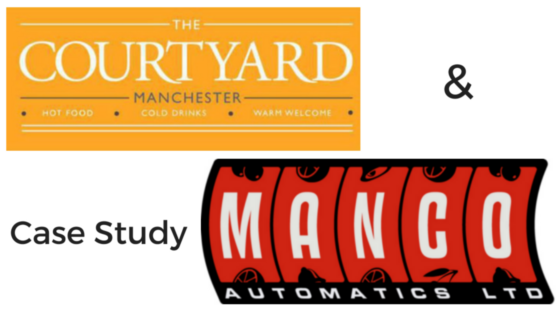 Manco Automatics has worked with The Courtyard for around two and a half years. We were first instructed to supply and maintain a popular quiz machine, to help keep those sharp student minds active, we suppose. This venue does have a regular quiz running that is popular with the odd egg head so our machine has been a good fit. After proving ourselves with the quiz machine we uncovered the opportunity to improve customer interaction even further by way of new, better maintained fruit machines. For a place like The Courtyard a fruit machine, properly looked after, can be a real asset. Not only from a revenue generation stand point but from a footfall perspective too. As we keep our machines up to date with the latest games and features, they tend to have a cult following of their own, which in turn can drive new customers into any club or pub. Now we have two of our most popular and profitable fruit machines keeping both client and end user happy. Pool tables came next and like any popular sports or student bar in Manchester knows, pool tables are a big deal. Since their installation we’ve all seen many coins set out as markers and the high level of inter friendship competition brewing at the Courtyard proves that they a big hit with the customers. We supply three, 6 foot, durable, high quality electronic Winner pool tables with a full maintenance package to ensure the end user gets the best experience and our customer gets a reliable, revenue generating service that keeps their customers coming back time after time. We are passionate about what we do but we are equally as passionate about keeping the pub and club scene of Manchester and the North West alive and well. Times have changed for the average sports bar, pub or club in our region. First the smoking ban hit footfall, then the modern and busy work life social life balance became a factor. Our point is, that unless you’re serving gourmet food or have a plush city centre location, it can be hard to find and keep customers. Manco aims to provide as many social clubs, pubs, sports bars or any venue used for socialising and entertaining with the latest, cleanest, most reliable and engaging fruit, quiz, pull tab machines and high quality well serviced pool tables as possible to ensure that our reputation for being the most fun and welcoming leisure equipment provider in the region is maintained. We’re also very keen to keep the pub and club industry relevant and growing. If you’re not happy with the condition of your machines or if you’re not making what you think you could from your pool tables, then maybe it’s time for a review. Our time served experts will assess your current machines or tables and advise on where both improvements and savings could be made. You’ve probably seen this logo around, but who are we, what do we do and who do we do it for? If you’re associated with or run a private members club, such as an armed services or local football club or if you run a pub, bingo hall or bar in or around Manchester chances are you’ll already know the logo above and may have even worked with us. If not, this blog post might just make it so. If you’re a member of, or run, a student union, college or sixth form common room, or if you’re a café owner or run a retirement home then this blog could really help you too. Manco Automatics provide profit generating fruit machines, gaming machines, pool tables, quiz machines and juke boxes for hire to a wide range of businesses and organisations, some of which you might not even expect. We’ve been at the heart of business in Manchester and our surrounding areas for nearly 40 years, and as the gaming and fruit machine market has developed over those years, so have we. From our humble beginnings we’ve developed our range of services and machines to be one of the most comprehensive in the country, all of which are proven to provide our clients with an extra reason to attract new and returning customers and grow their own revenue streams. We back this up with market leading, ultra reliable maintenance and competitive costs, making us first choice for most. Ever wondered how you can further engage your customers or help to destress staff or pupils? We probably have the answer in the form of a profit generating gaming machine or pool table. Category B4 – Cash prizes up to £400. Category B3a – Cash prizes up to £500. Category C – Cash prizes up to £100. Category B4 machines are the most common in clubs, and if your club falls below the de minimis limit for VAT, which it almost certainly does, you will be able to reclaim any tax paid to the fruit machine hire provider. You can have up to three Category B4 machines installed on your premises, and to boost takings we would recommend opting for machines with a note recycler fitted, allowing them not only to take payment using notes, but to pay out prizes in paper money too. Paying out cash prizes up to a maximum of £100, Category C machines, most commonly used in pubs, are a must in terms of customer expectation and licensee profit. This category of fruit machine thrives upon the innovation of the manufacturers developing new games to keep players interested and challenged. It is essential that pubs monitor the performance of their machines and react when interest in their current models begin to fall. The vast majority of free pubs will fall below the de-minimiss value for VAT, and will thus be able to reclaim all the VAT paid to their provider for the supply of said machines. We supply the highly versatile Supreme Prince and Winner range of pool tables. We can provide you with either electronic or mechanical coin validators set to a price of play to suit your clientele. We supply either 6’ or 7’ tables. But remember that, when choosing your table, a 4’ perimeter around the table is required for comfortable play. So now you know where you’ve seen our logo, and probably our vans too, and we’ve explained a bit about how we can help raise your profits and customer, staff or pupil engagement, why not give us a call for some free consultation.